South Korea is preparing to report its investigation results on suspected North Korean coal shipments to its ports to the UN Security Council next week at the earliest possible date, a government official said Saturday. 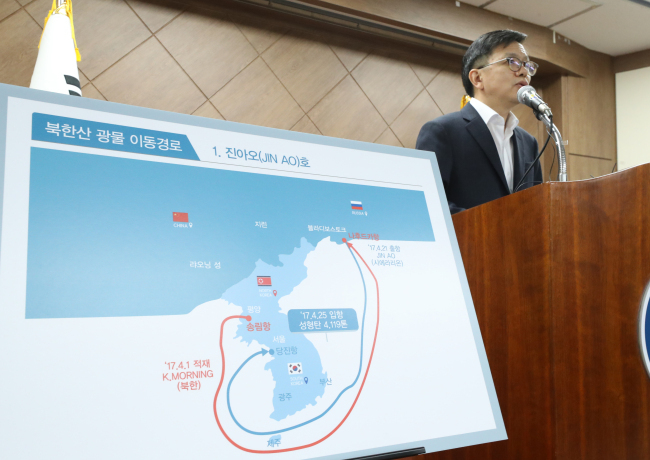 Seoul's customs office announced earlier this week that three South Korean firms imported North Korean coal and pig iron from Russia on seven occasions between April and October last year by forging customs documents in apparent violation of a UN sanctions resolution. Passed in August last year, UNSC Resolution 2371 imposes a blanket ban on the overseas sale of North Korean coal, iron ore and other mineral resources. "We have decided to report (our results) to the UN Security Council as soon as possible," the government official said. "We are thinking of reporting them next week if possible." The report will also include a list of four cargo ships used for the banned activities, including a Belize-flagged ship, the Jin Long, according to the official. The government earlier said the three remaining ships involved in North Korea's exports before August will likely be punished in accordance with South Korea's May 24 sanctions on the North.